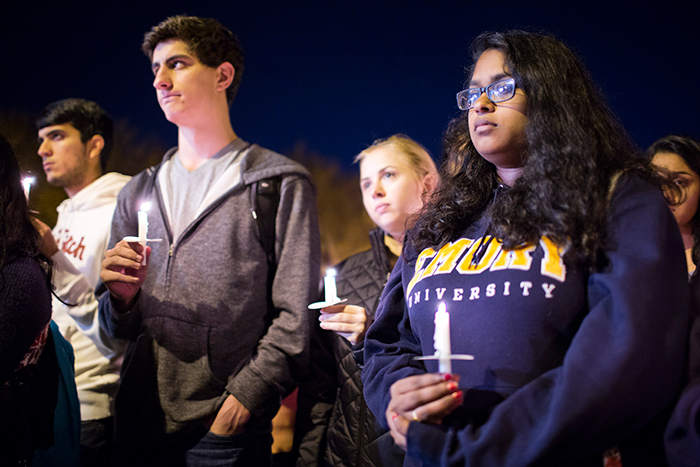 The Emory community came together Monday night for a candlelight vigil in response to violence around the world, including last week's deadly terror attacks in Beirut and Paris. 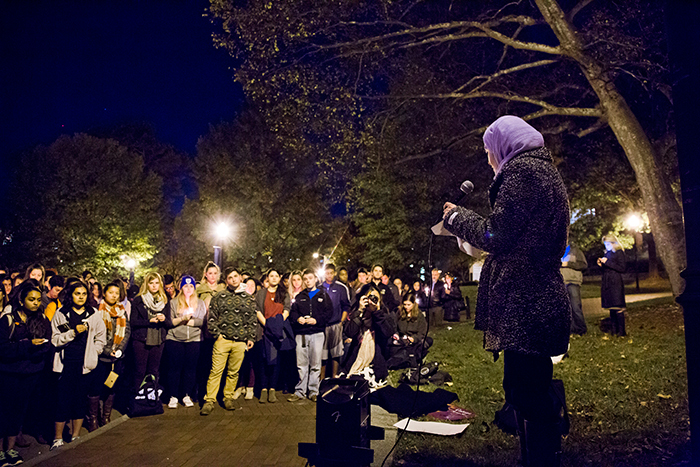 Hundreds gathered at 9 p.m. in Asbury Circle on Emory's Atlanta campus for the student-led event, which was sponsored by the Muslim Students Association and the French Club, with support from Campus Life and the Office of Spiritual and Religious Life. 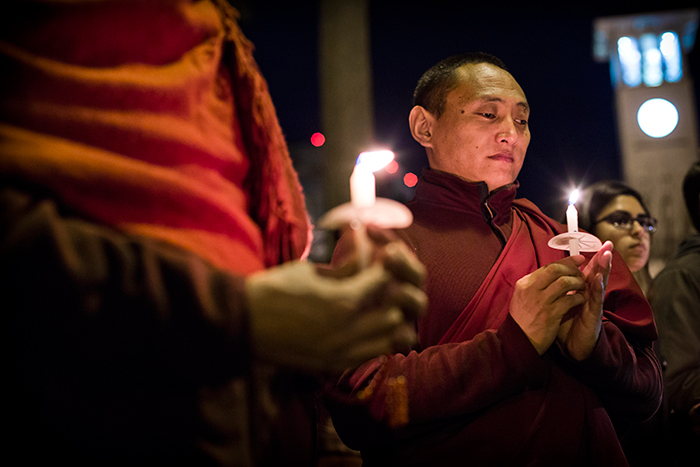 "We gather together to offer our prayers to people all over the world," said Rev. 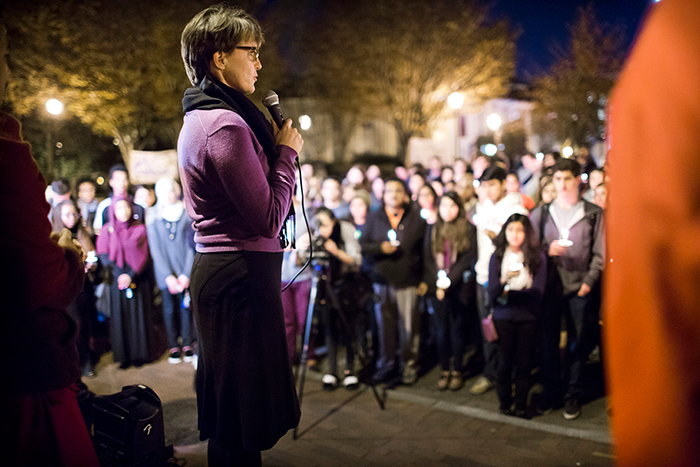 Lisa Garvin, associate dean of the chapel and religious life, as the vigil began. 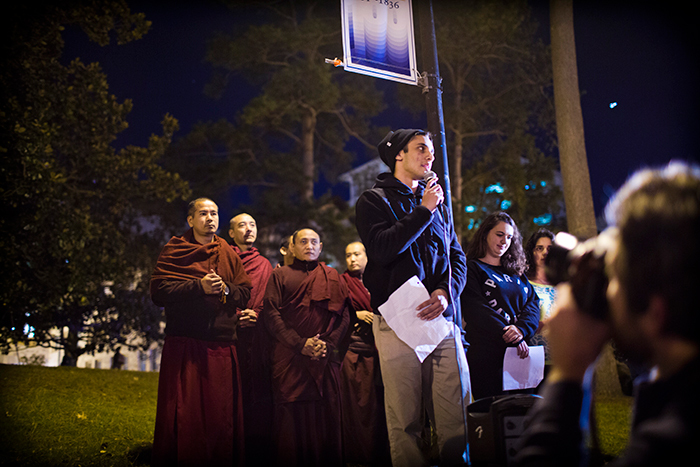 The crowd joined in a moment of silence, followed by a chant from Tibetan monks and a speaker from the Muslim Students Association. 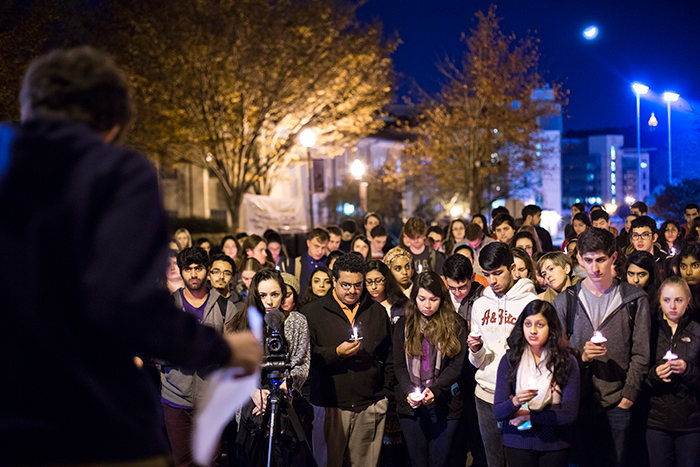 The evening included prayers in the Muslim, Christian, Jewish, Buddhist and Hindu traditions. A student from France also spoke of her family's experience in the aftermath of the Paris attacks. 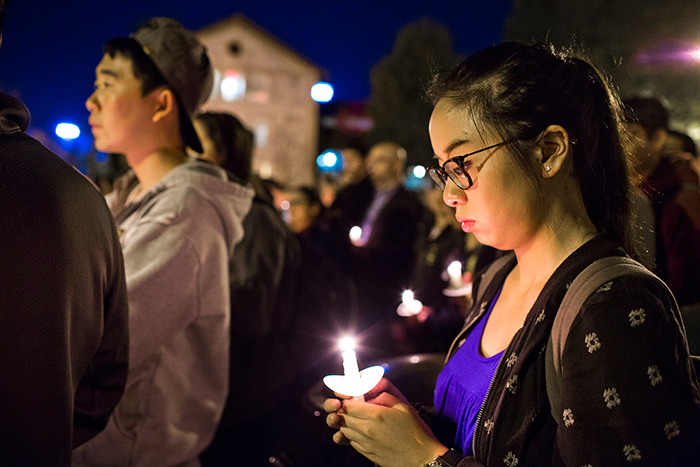 "Together with my family and all of France, know that we hear your prayers," she said. 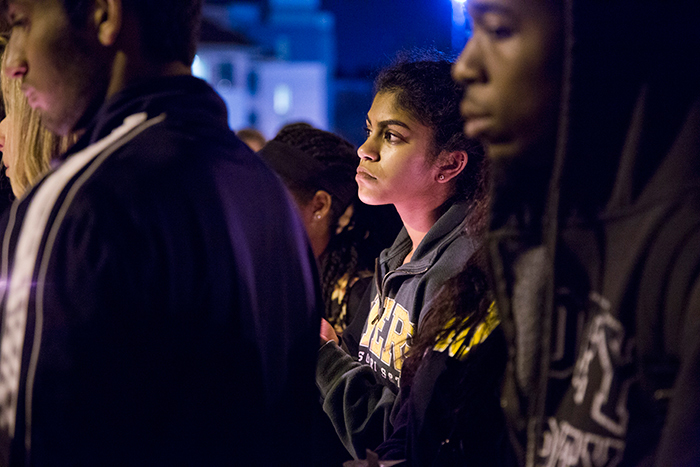 Emory community members who need individual support in the wake of the recent violence are encouraged to contact Counseling And Psychological Services or the Office of Spiritual and Religious Life. 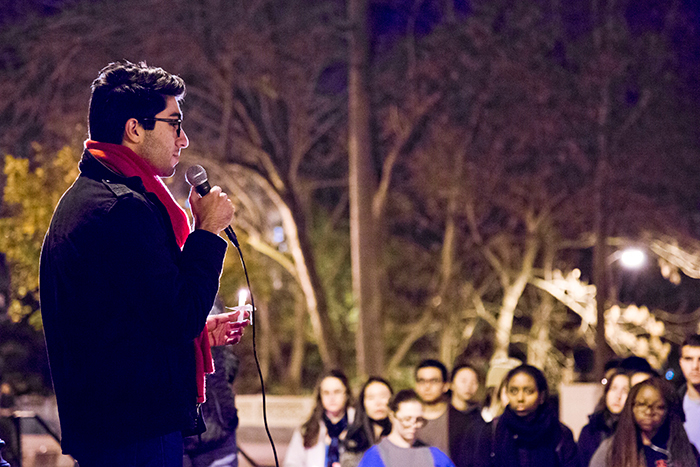 Students at Emory's Oxford College held a gathering Monday afternoon on the Quad, organized by Matthew Moyle, assistant professor of French. Speaking at the gathering, Moyle expressed the mourning all were feeling for those in Paris, but said that it is important to remember the victims of other attacks as well, including those in Beirut, Baghdad and Egypt. 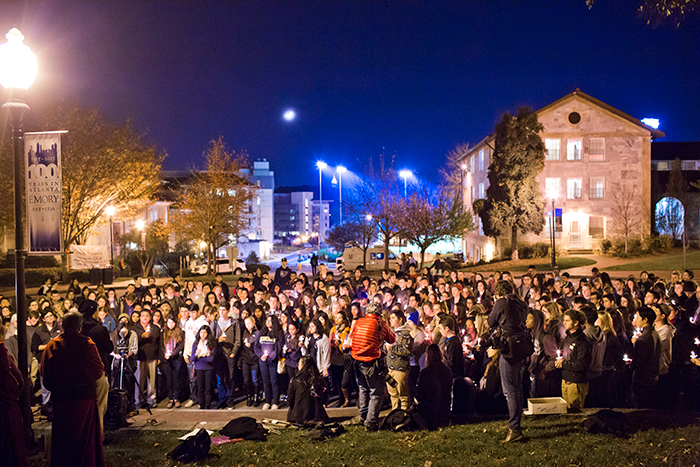 Attendees listened in silence as a chime rang 129 times in memory of those killed in Paris on Friday. 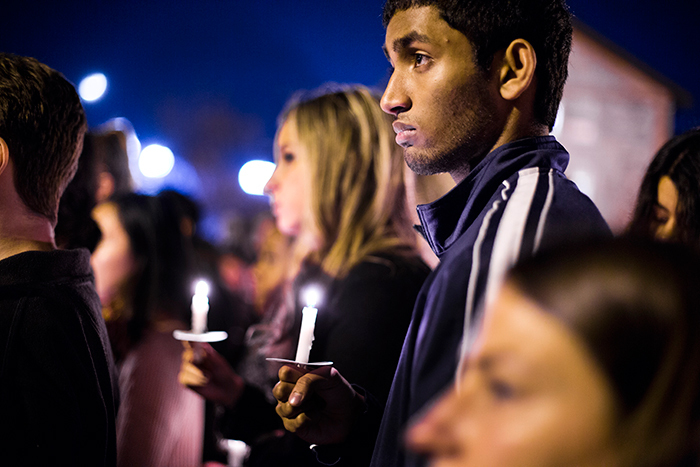 The Oxford College community will gather on Tuesday night at 9:45 p.m. for a candlelight vigil sponsored by Oxford Chaplain Lyn Pace, the Oxford French Club and the Oxford Muslim Students Association. 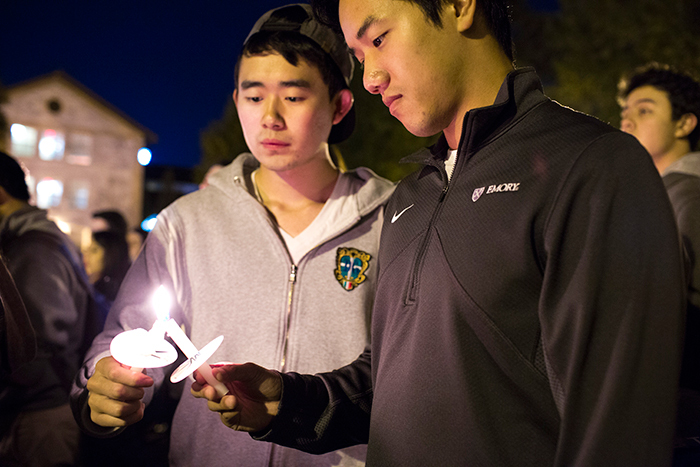 The vigil will begin in the Oxford Chapel with remarks and a time for reflection or prayer, then move to the quad, where candles will be lit. 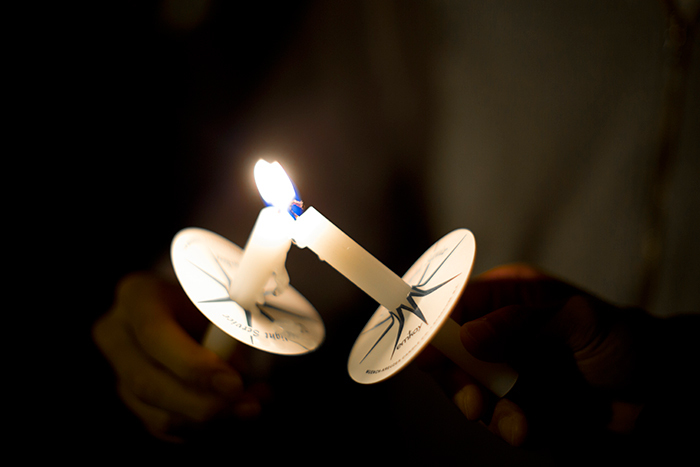 Members of the Oxford community who need support are asked to contact the Oxford Counseling Center or the Office of Religious and Spiritual Life on that campus.